May be requested by any licensed amateur radio or SWL listener. Awards will be electronically distributed. Only contacts during December 2013 are valid. Each station may be counted only one time. All bands and all modes. Awards will be personalized and sent in .pdf files. After the success of the Youngsters On The Air events in the summer we decided that it’s time to do some more action ! During the whole month of December several country’s will become active with YOTA as suffix for callsign. Let us all make YOTA populair in HAM radio and let us all help to put youngsters on the HAM radio train! You want to hear us on the air? 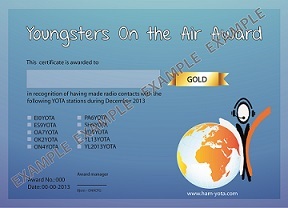 Listen for Youngsters On The Air callsigns in the whole month of December! Do you also want to use a callsign with YOTA in the suffix? Contact us for more information.